Fashioned from hazelnuts and pecans, Rowena Murray's whimsical lockets resemble something from a fairy story or woodland tale. After carving each one by hand, the London-based jeweler inserts Victorian-era locket fronts in silver and gold to juxtapose the juvenile and adult worlds. Childhood and nature are inextricably linked, says Murray, but our growing estrangement with the environment makes it an uneasy relationship. "The aim of these pieces is to bring it close to the body," she says. Nuts are undoubtedly a unique medium for jewelry, but Murray’s deft skills, honed at the prestigious Royal College of Art, renders them into wearable works of art. Murray pairs her found objects with antique hardware that complements the nut’s size, shape, and character, creating doorways into hidden interiors. 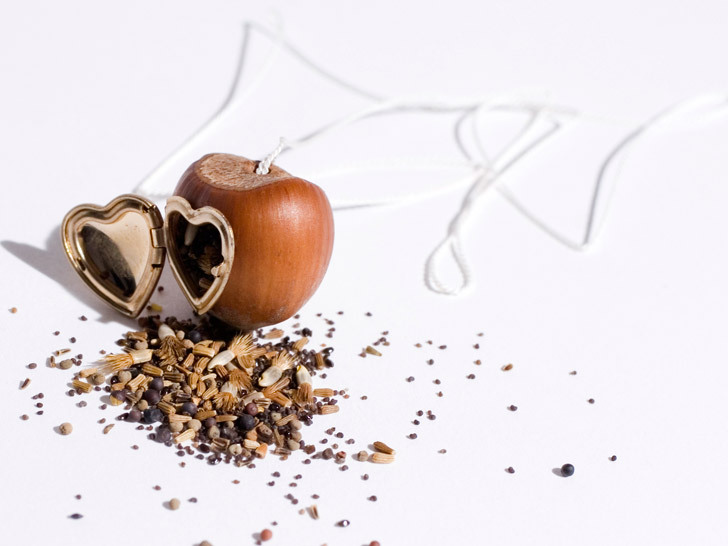 “Some lockets are left empty and some still contain the original pecan or hazelnut,” she tells Ecouterre. The perfect size for stashing tiny trinkets, secrets, or memories, Murray’s lockets make the commonplace appear new and wondrous. The perfect size for stashing tiny trinkets, secrets, or memories, Murray’s lockets make the commonplace appear new and wondrous once more. Like childhood, nature has its own brand of magic. “Whether by reusing objects, remodeling them, or decorating them to make them new again, I hope to reawaken the viewers’ imagination and fascination with nature,” she says. 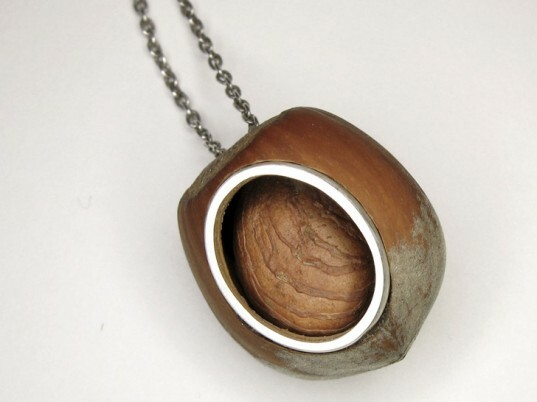 Nuts are undoubtedly a unique medium for jewelry, but Murray's deft skills, honed at the prestigious Royal College of Art, renders them into wearable works of art. Murray pairs her found objects with antique hardware that complements the nut's size, shape, and character, creating doorways into hidden interiors. "Some lockets are left empty and some still contain the original pecan or hazelnut," she tells Ecouterre. The perfect size for stashing tiny trinkets, secrets, or memories, Murray's lockets make the commonplace appear new and wondrous once more. Like childhood, nature has its own brand of magic. "Whether by reusing objects, remodeling them, or decorating them to make them new again, I hope to reawaken the viewers’ imagination and fascination with nature," she says.